This is a list of sites in Minnesota which are included in the National Register of Historic Places. There are more than 1,600 properties and historic districts listed on the NRHP; each of Minnesota's 87 counties has at least 2 listings. Twenty-two sites are also National Historic Landmarks. Minneapolis listings are in the Hennepin County list; St. Paul's listings are in the Ramsey County list. 45°44′11″N 93°56′43″W﻿ / ﻿45.736515°N 93.945352°W﻿ / 45.736515; -93.945352﻿ (Church of Sts. Peter and Paul-Catholic) Gilman Landmark religious complex of a Polish American settlement, consisting of a 1909 parochial school, 1924 rectory, and 1930 Beaux-Arts church. 45°34′44″N 93°57′01″W﻿ / ﻿45.578976°N 93.950223°W﻿ / 45.578976; -93.950223﻿ (Cota Round Barns) St. George Township Two round barns constructed in the early 1920s, prominent examples of the numerous reinforced concrete structures built in the area by contractor Al Cota and his successors from 1913 through the 1940s. 45°42′48″N 94°06′38″W﻿ / ﻿45.713327°N 94.110686°W﻿ / 45.713327; -94.110686﻿ (Esselman Brothers General Store) Mayhew Lake Township Well-preserved 1897 example of the general stores common to Benton County's crossroads communities, and a reminder of Mayhew Lake Township's settlement by German Americans. Langola Township Archaeological site potentially dating back to the Archaic Period, having yielded a few stone tools but no ceramics. 45°35′16″N 94°09′47″W﻿ / ﻿45.5879°N 94.163024°W﻿ / 45.5879; -94.163024﻿ (Leonard Robinson House) Sauk Rapids 1873 house of a pioneer in the area's significant granite quarrying industry. 47°32′36″N 95°29′05″W﻿ / ﻿47.543333°N 95.484722°W﻿ / 47.543333; -95.484722﻿ (Gran Evangelical Lutheran Church) Bagley vicinity 1897 log church—the first church in what became Clearwater County—which played a key role in the area's settlement by loggers and homesteaders and in the religious life of its Norwegian immigrants. 47°11′39″N 95°13′51″W﻿ / ﻿47.19407°N 95.230884°W﻿ / 47.19407; -95.230884﻿ (Itasca Bison Site) Park Rapids vicinity Site where Archaic hunters killed and butchered Bison occidentalis. Also a contributing property to Itasca State Park. 47°11′38″N 95°13′03″W﻿ / ﻿47.193889°N 95.2175°W﻿ / 47.193889; -95.2175﻿ (Itasca State Park) Park Rapids vicinity Minnesota's oldest state park, established in 1891. Also significant for its extensive archaeological resources, association with the quest for the Mississippi River headwaters, pioneer sites, and 72 park facilities built 1905–1942 noted for their rustic log construction and association with early park development. Extends into Becker and Hubbard Counties. Bagley vicinity Woodland period site for wild rice harvesting, a subsistence activity unique to this region of North America. Also noted for an artifact assemblage suggesting ties to the north and the northern Great Plains. Shevlin vicinity Woodland period site for wild rice harvesting, with artifacts associated with northern Minnesota, the northern plains, and the Mississippi basin, indicating broad migration and trade. 43°56′06″N 94°55′29″W﻿ / ﻿43.935009°N 94.924761°W﻿ / 43.935009; -94.924761﻿ (Isaac Bargen House) Mountain Lake 1888 house of a transformational educator and administrator (1857–1943) who was one of the first in his Mennonite community to promote secular public education and government service. 44°02′23″N 95°26′07″W﻿ / ﻿44.039748°N 95.435303°W﻿ / 44.039748; -95.435303﻿ (Chicago, St. Paul, Minneapolis, and Omaha Depot) Westbrook 1900 railway station, the last remaining on a branch line that opened the area up to development, and the essential link of commerce and communication for Westbrook and its surrounding farmers. Now a museum. 43°51′58″N 95°07′01″W﻿ / ﻿43.86598°N 95.117035°W﻿ / 43.86598; -95.117035﻿ (Cottonwood County Courthouse) Windom Prominent 1904 courthouse noted for the neoclassicism expressed throughout the building, from the exterior architecture to the interior design and artwork. 44°05′32″N 95°03′10″W﻿ / ﻿44.092239°N 95.052885°W﻿ / 44.092239; -95.052885﻿ (Jeffers Petroglyphs Site) Jeffers vicinity 300-by-50-yard (274 by 46 m) rock outcrop bearing some 4,000 petroglyphs ranging from 7,000 to 250 years old, nominated as Minnesota's finest collection of precontact Native American rock art. Now a public site managed by the Minnesota Historical Society. 43°55′15″N 94°53′26″W﻿ / ﻿43.920833°N 94.890556°W﻿ / 43.920833; -94.890556﻿ (Mountain Lake Site) Mountain Lake vicinity Deeply stratified village site spanning the precontact era from the late Archaic to an Oneota occupation, with a particular concentration of Woodland period ceramics. 43°39′02″N 93°22′08″W﻿ / ﻿43.65051°N 93.368999°W﻿ / 43.65051; -93.368999﻿ (Albert Lea City Hall) Albert Lea 1903 municipal building that served as Albert Lea's seat of government until 1968. Also a contributing property to the Albert Lea Commercial Historic District. 43°38′54″N 93°22′07″W﻿ / ﻿43.64839°N 93.368715°W﻿ / 43.64839; -93.368715﻿ (Albert Lea Commercial Historic District) Albert Lea Three-block retail district whose buildings, constructed 1874–1928, are noted for their fine commercial architecture and multigenerational occupation by family businesses. 43°38′41″N 93°22′10″W﻿ / ﻿43.644676°N 93.369361°W﻿ / 43.644676; -93.369361﻿ (Chicago, Milwaukee, St. Paul and Pacific Railroad Depot) Albert Lea 1914 train station emblematic of the rail connections that contributed to Albert Lea's growth and development. 43°45′49″N 93°19′44″W﻿ / ﻿43.763538°N 93.328812°W﻿ / 43.763538; -93.328812﻿ (Clarks Grove Cooperative Creamery) Clarks Grove Third home of Minnesota's first and most influential cooperative creamery, built in 1927 with a second-floor meeting hall. Also noted for its fine architecture and association with a successful Danish American dairying community. 43°36′30″N 93°10′10″W﻿ / ﻿43.608292°N 93.16955°W﻿ / 43.608292; -93.16955﻿ (Lodge Zare Zapadu No. 44) Hayward vicinity 1909 meeting hall of the Zapadni Ceska Bratrska Jednota fraternal society; the last of three halls that served as social and recreational centers for southeast Freeborn County's Czech American population. 43°39′05″N 93°22′33″W﻿ / ﻿43.651276°N 93.375797°W﻿ / 43.651276; -93.375797﻿ (H. A. Paine House) Albert Lea 1898 Queen Anne house, called "a masterpiece and a perfect example" of the style in its nomination. 43°39′07″N 93°22′15″W﻿ / ﻿43.651983°N 93.370827°W﻿ / 43.651983; -93.370827﻿ (Dr. Albert C. Wedge House) Albert Lea Circa-1880 house noted for its exemplary Shingle style architecture and association with Albert C. Wedge (1834–1911), Albert Lea's leading doctor for over 50 years and an active figure in local and state affairs. 46°04′01″N 95°52′57″W﻿ / ﻿46.06684°N 95.88237°W﻿ / 46.06684; -95.88237﻿ (Fort Pomme de Terre Site) Ashby vicinity Site of an 1859 stagecoach station expanded into a U.S. Army fort for a few years after the Dakota War of 1862; a uniquely well-documented site from the earliest period of white settlement. 45°59′41″N 95°58′37″W﻿ / ﻿45.994837°N 95.976809°W﻿ / 45.994837; -95.976809﻿ (Grant County Courthouse) Elbow Lake One of Minnesota's few monumental Victorian courthouses remaining, built in 1905; Grant County's most prominent turn-of-the-20th-century building and its long-serving seat of government, and an important work of architects Bell & Detweiler and interior designer Odin J. Oyen. 45°54′39″N 95°53′19″W﻿ / ﻿45.91094°N 95.888498°W﻿ / 45.91094; -95.888498﻿ (Roosevelt Hall) Barrett Municipal auditorium built 1933–34, one of Minnesota's few surviving projects by the short-lived Civil Works Administration, and an example of the refined but low-cost public buildings the New Deal brought to small Minnesota towns. 45°59′38″N 95°58′35″W﻿ / ﻿45.99392°N 95.976267°W﻿ / 45.99392; -95.976267﻿ (Anna J. Scofield Memorial Auditorium and Harold E. Thorson Memorial Library) Elbow Lake Dual-purpose municipal facility constructed 1933–34, the first building project in Minnesota funded by the Public Works Administration and one of the program's best works nationally, according to the agency in 1939. 47°21′59″N 94°49′21″W﻿ / ﻿47.366423°N 94.822593°W﻿ / 47.366423; -94.822593﻿ (Consolidated School District No. 22) Nary Two-story school built in 1918, a distinctive example of the larger facilities built to begin consolidating Minnesota's rural school districts. Also called Nary School; now the Helga Township Community Center. 46°55′12″N 95°03′50″W﻿ / ﻿46.91999°N 95.063777°W﻿ / 46.91999; -95.063777﻿ (Hubbard County Courthouse) Park Rapids 1900 Neoclassical courthouse, a prominent public building and home of the county government into the 1970s. Now houses the Hubbard County Historical Museum and Nemeth Art Center. 47°11′38″N 95°13′03″W﻿ / ﻿47.193889°N 95.2175°W﻿ / 47.193889; -95.2175﻿ (Itasca State Park) Park Rapids vicinity Minnesota's oldest state park, established in 1891. Also significant for its extensive archaeological resources, association with the quest for the Mississippi River headwaters, pioneer sites, and 72 park facilities built 1905–1942 noted for their rustic log construction and association with early park development. Extends into Becker and Clearwater Counties. 47°04′06″N 94°54′03″W﻿ / ﻿47.068433°N 94.900859°W﻿ / 47.068433; -94.900859﻿ (Louis J. Moser House) Thorpe Township Circa-1907 homesteader's cabin used as one of Minnesota's first fishing resorts. Also noted for its locally unusual post and sill construction. Now the main office of Fremont's Point Resort. 46°55′16″N 95°03′38″W﻿ / ﻿46.921201°N 95.060635°W﻿ / 46.921201; -95.060635﻿ (Park Rapids Jail) Park Rapids 1901 jail, the only largely intact municipal building from Park Rapid's early boom years. Park Rapids vicinity Large habitation and mound complex at the junction of two major river routes, likely harboring a deep Woodland period stratigraphy at the far northern boundary of Mississippian culture influence. Hubbard Township 1899 Independent Order of Odd Fellows hall. Restored in 1989 but destroyed by arson on February 14, 1991. 43°47′41″N 95°19′02″W﻿ / ﻿43.794722°N 95.317222°W﻿ / 43.794722; -95.317222﻿ (Church of the Sacred Heart (Catholic)) Heron Lake Southwest Minnesota's largest and most elaborately appointed early-20th-century church, built 1920–21 with Neoclassical and Baroque Revival influences, conveying its importance as a religious and cultural center. 43°33′59″N 95°02′07″W﻿ / ﻿43.566326°N 95.035182°W﻿ / 43.566326; -95.035182﻿ (District No. 92 School) Jackson Unusual octagonal schoolhouse built in 1906, one of only two surviving examples in Minnesota inspired by the octagon house concept promoted by Orson Squire Fowler. 43°37′18″N 94°59′16″W﻿ / ﻿43.621594°N 94.987713°W﻿ / 43.621594; -94.987713﻿ (Jackson Commercial Historic District) Jackson Cohesive commercial district charting the small businesses that composed a late-19th/early-20th-century railroad-based trade center. 31 contributing properties built 1880–1928 include seven associated with influential local businessman Frank A. Matuska (1872–1947). 43°37′16″N 94°59′25″W﻿ / ﻿43.621223°N 94.990159°W﻿ / 43.621223; -94.990159﻿ (Jackson County Courthouse) Jackson 1908 courthouse, longstanding government seat and local landmark distinguished by the Neoclassical architecture and art that carry through from exterior to interior. 43°30′53″N 95°04′45″W﻿ / ﻿43.514722°N 95.079167°W﻿ / 43.514722; -95.079167﻿ (George M. Moore Farmstead) Jackson Farmstead also known as Moorland featuring Jackson County's most architecturally sophisticated farmhouse and two other American Craftsman buildings, all constructed in 1917. Heron Lake 1896 Romanesque Revival school. Closed in 1982 and demolished in 1986. 45°51′16″N 93°19′55″W﻿ / ﻿45.854451°N 93.331883°W﻿ / 45.854451; -93.331883﻿ (Ann River Logging Company Farm) Mora vicinity One of Kanabec County's earliest and largest farmsteads, established in 1880 to support a logging operation (the era's leading local industry) as a headquarters, food and feed producer, and stable for work animals. 45°52′39″N 93°17′36″W﻿ / ﻿45.877433°N 93.293444°W﻿ / 45.877433; -93.293444﻿ (Kanabec County Courthouse) Mora 1894 courthouse with two 20th-century additions, the long-serving seat of county government. Also noted for its unusually restrained Romanesque Revival architecture. 45°49′52″N 93°25′41″W﻿ / ﻿45.830982°N 93.428046°W﻿ / 45.830982; -93.428046﻿ (Ogilvie Watertower) Ogilvie Rare surviving example of Minnesota's earliest reinforced-concrete watertowers—built in 1918—and a symbol of the local infrastructure improvements that enabled the organization of Ogilvie's fire department. 45°52′41″N 93°17′43″W﻿ / ﻿45.878143°N 93.295236°W﻿ / 45.878143; -93.295236﻿ (C. E. Williams House) Mora 1902 Queen Anne house, significant as one of Kanabec County's most distinctive residences and for its 1909–1951 occupancy by local civic leader C. E. Williams. 45°52′34″N 93°17′18″W﻿ / ﻿45.876219°N 93.288319°W﻿ / 45.876219; -93.288319﻿ (Zetterberg Company) Mora Railside farm machinery dealership built in 1912, reflecting the region's shift from logging to agriculture and the railroads' influence on town development. Likely demolished (see talk page). 45°52′26″N 93°18′29″W﻿ / ﻿45.873783°N 93.30808°W﻿ / 45.873783; -93.30808﻿ (Coin School) Mora vicinity 1899 rural schoolhouse, moved to the Kanabec History Center in 1995. 48°43′00″N 96°37′27″W﻿ / ﻿48.716667°N 96.624167°W﻿ / 48.716667; -96.624167﻿ (Lake Bronson Site) Lake Bronson vicinity Middle Woodland period burial mounds and the site of a Middle/Late Woodland seasonal bison-hunting village. 48°43′24″N 96°37′22″W﻿ / ﻿48.723309°N 96.622787°W﻿ / 48.723309; -96.622787﻿ (Lake Bronson State Park WPA/Rustic Style Historic Resources) Lake Bronson vicinity Park developments significant as examples of New Deal federal work relief, strategic placement of state recreational facilities, and National Park Service rustic design, with 12 contributing properties built 1936–1940, including a unique observation/water tower and a dam engineered over quicksand. 48°58′57″N 96°27′06″W﻿ / ﻿48.982372°N 96.451649°W﻿ / 48.982372; -96.451649﻿ (St. Nicholas Orthodox Church) Caribou Township 1905 church associated with Ukrainian immigrant settlement in northwestern Minnesota. 49°00′00″N 97°12′25″W﻿ / ﻿48.999872°N 97.206953°W﻿ / 48.999872; -97.206953﻿ (U.S. Inspection Station-Noyes, Minnesota) Noyes 1931 Colonial Revival customs and immigration station, a well-preserved example of the nation's first purpose-built border checkpoints at land crossings. 48°42′58″N 94°36′00″W﻿ / ﻿48.716004°N 94.600123°W﻿ / 48.716004; -94.600123﻿ (Canadian National Railways Depot) Baudette 1923 train station owned by the Canadian National Railway but also housing U.S. federal border agencies; a symbol of international cooperation and the chief conduit for Baudette's growth and development. 49°21′42″N 94°58′51″W﻿ / ﻿49.361794°N 94.980918°W﻿ / 49.361794; -94.980918﻿ (Fort St. Charles Archeological Site) Angle Inlet vicinity Site of a French outpost active 1732 to the mid-1750s, a key vestige of European exploration and colonialism. A reconstruction was built nearby in the 1950s. 48°36′37″N 95°10′55″W﻿ / ﻿48.610278°N 95.181944°W﻿ / 48.610278; -95.181944﻿ (Norris Camp) Roosevelt vicinity Rare surviving Civilian Conservation Corps work camp with 14 remaining buildings constructed 1935–36, then used 1936–42 as the headquarters for Minnesota's largest Resettlement Administration project, which relocated settlers from inadequate farmland and restored it for resource extraction and recreation. 49°22′31″N 95°09′00″W﻿ / ﻿49.375248°N 95.14997°W﻿ / 49.375248; -95.14997﻿ (Northwest Point) Angle Inlet vicinity Remote wedge of land from which the Canada–United States border was drawn to satisfy the Treaty of 1818—creating the distinctive Northwest Angle exclave—but mistakenly used by Canadian commercial interests until 1874. 44°16′05″N 96°08′01″W﻿ / ﻿44.267983°N 96.133579°W﻿ / 44.267983; -96.133579﻿ (Danebod) Tyler 1889 meeting hall, 1895 church, 1904 gymnasium, and 1917 folk school central to Minnesota's first Danish immigrant settlement, founded in 1884. 44°19′40″N 96°22′58″W﻿ / ﻿44.327744°N 96.382819°W﻿ / 44.327744; -96.382819﻿ (Drammen Farmers' Club) Drammen Township Long-serving 1921 meeting hall, atypically built by a purely social (rather than religious or political) club to host events for a sparsely populated agricultural community. 44°15′39″N 96°17′10″W﻿ / ﻿44.260757°N 96.286226°W﻿ / 44.260757; -96.286226﻿ (Lake Benton Opera House and Kimball Building) Lake Benton 1896 opera house that hosted numerous community events and was restored to its original use in 1970. Boundary expanded in 1982 (#82002979) to include the adjacent commercial building constructed at the same time. 44°27′46″N 96°15′08″W﻿ / ﻿44.462777°N 96.252141°W﻿ / 44.462777; -96.252141﻿ (Lincoln County Courthouse and Jail) Ivanhoe 1904 jail and 1919 courthouse, prominent public buildings and longtime seat of county government; further associated with the effects of railroad placement in determining Lincoln County's most viable communities. 44°16′56″N 96°08′14″W﻿ / ﻿44.282117°N 96.137297°W﻿ / 44.282117; -96.137297﻿ (Lincoln County Fairgrounds) Tyler Unusually intact fairground with 18 contributing properties built 1921–1945, representative of Lincoln County's agriculture and strong county fair tradition. 44°15′37″N 96°17′10″W﻿ / ﻿44.260198°N 96.28604°W﻿ / 44.260198; -96.28604﻿ (Ernst Osbeck House) Lake Benton One of Lake Benton's most prominent houses, built in 1887 for Ernest Osbeck (b. 1859), a prosperous grocery merchant who helped found numerous local endeavors. 44°16′54″N 96°08′02″W﻿ / ﻿44.281675°N 96.133968°W﻿ / 44.281675; -96.133968﻿ (Tyler Public School) Tyler Distinctive public school noted for its well-preserved Renaissance/Romanesque Revival original section, built in 1903. 47°18′51″N 95°58′09″W﻿ / ﻿47.31407°N 95.969138°W﻿ / 47.31407; -95.969138﻿ (Mahnomen City Hall) Mahnomen Distinctive 1937 municipal building with an asymmetrical design, cut fieldstone façade, and sympathetic 1948 addition, emblematic of the Depression-era infrastructure sponsored by the Works Progress Administration. 47°19′04″N 95°58′09″W﻿ / ﻿47.317785°N 95.969205°W﻿ / 47.317785; -95.969205﻿ (Mahnomen County Courthouse) Mahnomen 1909 courthouse expanded in 1977, noted for its simple Neoclassical architecture and long service as the seat of an unusual county established entirely within a Native American reservation. 47°19′20″N 95°58′39″W﻿ / ﻿47.322345°N 95.977582°W﻿ / 47.322345; -95.977582﻿ (Mahnomen County Fairgrounds Historic District) Mahnomen vicinity Fairground with eight contributing properties built 1936–38, representative of the importance of the county fair in rural Minnesota culture and the enduring output of the Works Progress Administration. 48°22′00″N 96°34′03″W﻿ / ﻿48.366571°N 96.567421°W﻿ / 48.366571; -96.567421﻿ (Larson Mill) Argyle vicinity One of western Minnesota's best surviving early gristmills, built in 1889 and restored to operating capacity with its original 1878 steam engine. 48°21′45″N 96°34′12″W﻿ / ﻿48.3625°N 96.57°W﻿ / 48.3625; -96.57﻿ (Old Mill State Park WPA/Rustic Style Historic Resources) Argyle vicinity Eight park facilities built 1937–41, significant as examples of New Deal federal work relief, early Minnesota state park development, NPS Rustic split-stone architecture, and environmentally sensitive master planning. 48°11′47″N 96°46′24″W﻿ / ﻿48.196424°N 96.773377°W﻿ / 48.196424; -96.773377﻿ (K. J. Taralseth Company) Warren 1911 commercial building that housed a major local retailer active 1888–1959, various offices, and a Masonic Temple that was a key venue for social events. 44°46′14″N 94°08′52″W﻿ / ﻿44.770523°N 94.147848°W﻿ / 44.770523; -94.147848﻿ (Glencoe Grade and High School) Glencoe 1933 brick school, Glencoe's sole public education facility for kindergarten through high school until 1954. Also housed community services and events. 44°53′13″N 94°22′11″W﻿ / ﻿44.886815°N 94.369614°W﻿ / 44.886815; -94.369614﻿ (Merton S. Goodnow House) Hutchinson 1913 Prairie School house designed by Purcell & Elmslie, a fine example of the architectural firm's work, which was typified in its early years by modest residences for small lots. 44°53′30″N 94°22′05″W﻿ / ﻿44.891685°N 94.368074°W﻿ / 44.891685; -94.368074﻿ (Hutchinson Carnegie Library) Hutchinson 1904 Carnegie library noted for its Neoclassical architecture and role in the intellectual and cultural life of Hutchinson. 44°54′24″N 94°16′37″W﻿ / ﻿44.906771°N 94.277075°W﻿ / 44.906771; -94.277075﻿ (Komensky School) Hutchinson vicinity School active 1912–1959, serving as the focal point of a rural Czech American community. 44°46′11″N 94°09′02″W﻿ / ﻿44.7698°N 94.150681°W﻿ / 44.7698; -94.150681﻿ (McLeod County Courthouse) Glencoe Long-serving government seat, dating to 1876; extensively enlarged and remodeled in 1909 to become McLeod County's leading example of Beaux-Arts architecture. 44°53′34″N 94°22′23″W﻿ / ﻿44.89288°N 94.373172°W﻿ / 44.89288; -94.373172﻿ (Harry Merrill House) Hutchinson House occupied 1886–1932 by local education leader Harry Merrill, superintendent of Hutchinson public schools for 33 years. 44°57′54″N 94°02′48″W﻿ / ﻿44.965019°N 94.046531°W﻿ / 44.965019; -94.046531﻿ (Winsted City Hall) Winsted Well-preserved example of a late-19th-century Queen Anne municipal building—constructed in 1895—and the long-serving seat of local government. 47°18′00″N 96°31′00″W﻿ / ﻿47.29996°N 96.516623°W﻿ / 47.29996; -96.516623﻿ (Ada Village Hall) Ada 1904 Classical Revival municipal hall designed by Omeyer & Thori. 47°17′54″N 96°30′44″W﻿ / ﻿47.298256°N 96.512323°W﻿ / 47.298256; -96.512323﻿ (Congregational Church of Ada) Ada 1900 brick American Craftsman church with Queen Anne belfry. 47°17′54″N 96°30′49″W﻿ / ﻿47.298441°N 96.513474°W﻿ / 47.298441; -96.513474﻿ (Norman County Courthouse) Ada 1904 brick Romanesque Revival courthouse designed by Omeyer & Thori. 47°27′20″N 96°47′28″W﻿ / ﻿47.455563°N 96.791104°W﻿ / 47.455563; -96.791104﻿ (Zion Lutheran Church) Shelly vicinity 1883 frame Gothic Revival church of a Norwegian immigrant congregation. Twin Valley vicinity 1916 water-powered flour mill. Continued to operate until August 13, 1989, when it was struck by lightning and burned down. 48°07′10″N 96°10′34″W﻿ / ﻿48.119359°N 96.176065°W﻿ / 48.119359; -96.176065﻿ (Minneapolis, St. Paul and Sault Ste. Marie Depot) Thief River Falls Distinctive 1914 American Craftsman train station associated with the development of the rail network and agriculture in northwestern Minnesota and South Dakota. Listing includes a 1912 2-8-2 steam locomotive. 47°58′24″N 96°28′23″W﻿ / ﻿47.973296°N 96.473179°W﻿ / 47.973296; -96.473179﻿ (Red River Trail: Goose Lake Swamp Section) Polk Centre Township Unimproved one-mile fragment of the Woods Trail route in use circa 1844–1871, Minnesota's best preserved segment of the Red River Trails. 48°07′02″N 96°10′52″W﻿ / ﻿48.117276°N 96.181137°W﻿ / 48.117276; -96.181137﻿ (Thief River Falls Public Library) Thief River Falls Well-preserved example of Minnesota's Carnegie libraries, built in 1914 with fine craftsmanship by local firms. 47°46′27″N 96°36′15″W﻿ / ﻿47.774264°N 96.604291°W﻿ / 47.774264; -96.604291﻿ (Cathedral of the Immaculate Conception) Crookston 1912 cathedral that served as the religious and administrative center of the 14-county Roman Catholic Diocese of Crookston until 1953. 47°47′32″N 96°26′54″W﻿ / ﻿47.792341°N 96.448309°W﻿ / 47.792341; -96.448309﻿ (Church of St. Peter-Catholic) Crookston vicinity Exemplary Gothic Revival church completed in 1915 and its 1902 rectory, anchors of a Catholic French Canadian settlement. 47°46′25″N 96°36′18″W﻿ / ﻿47.773727°N 96.604875°W﻿ / 47.773727; -96.604875﻿ (Crookston Carnegie Public Library) Crookston Well preserved Carnegie library built 1907–08, noted for its Neoclassical design by local architect Bert Keck. 47°46′27″N 96°36′27″W﻿ / ﻿47.774044°N 96.607549°W﻿ / 47.774044; -96.607549﻿ (Crookston Commercial Historic District) Crookston Largest and most intact late-19th/early-20th-century commercial district in Minnesota's Red River Valley, with 39 contributing properties mostly built 1882–1920s. 47°46′58″N 96°36′20″W﻿ / ﻿47.782769°N 96.605459°W﻿ / 47.782769; -96.605459﻿ (E. C. Davis House) Crookston Distinctive Italianate house built 1879–80 for a railroad contractor who became one of Crookston's first settlers and leading politicians. 47°55′49″N 97°01′29″W﻿ / ﻿47.930234°N 97.024612°W﻿ / 47.930234; -97.024612﻿ (Hamm Brewing Company Beer Depot) East Grand Forks 1907 warehouse established by the Saint Paul-based Hamm's Brewery, a rare extant symbol of a Minnesota brewery's regional expansion. 47°55′41″N 95°46′27″W﻿ / ﻿47.928107°N 95.774243°W﻿ / 47.928107; -95.774243﻿ (Clearwater Evangelical Lutheran Church) Oklee vicinity 1912 church and adjacent cemetery, the last surviving example built by the area's Norwegian settlers and a key venue for preserving their ethnic heritage. 47°53′06″N 96°16′27″W﻿ / ﻿47.884874°N 96.274249°W﻿ / 47.884874; -96.274249﻿ (Red Lake County Courthouse) Red Lake Falls 1910 courthouse noted for its central role in county affairs and the prominence of its hilltop Beaux-Arts design. 44°34′34″N 94°58′35″W﻿ / ﻿44.57601°N 94.976496°W﻿ / 44.57601; -94.976496﻿ (Birch Coulee) Morton vicinity Site of the thirty-hour Battle of Birch Coulee on September 2–3, 1862; the deadliest defeat of U.S. military forces during the Dakota War of 1862. Now a Renville County park with interpretive markers. 44°41′47″N 95°19′22″W﻿ / ﻿44.696502°N 95.32275°W﻿ / 44.696502; -95.32275﻿ (Joseph Brown House Ruins) Sacred Heart vicinity Ruins of the 1861 house of influential Minnesota settler Joseph R. Brown (1805–1870). Also associated with native–white relations, white settlement and reservation establishment on the upper Minnesota River, and the outbreak of the Dakota War of 1862. Now the Joseph R. Brown State Wayside. 44°46′36″N 94°59′23″W﻿ / ﻿44.776667°N 94.989722°W﻿ / 44.776667; -94.989722﻿ (Heins Block) Olivia Prominent 1896 mixed-use building that provided key commercial, office, residential, and meeting space throughout Olivia's development. 44°47′13″N 95°21′03″W﻿ / ﻿44.786863°N 95.350918°W﻿ / 44.786863; -95.350918﻿ (Hotel Sacred Heart) Sacred Heart 1914 hotel and restaurant, a prominent small-town venue offering lodging for rail-based business travelers as well as early automotive tourists on the Yellowstone Trail, plus a banquet hall for local events. 44°31′35″N 94°43′13″W﻿ / ﻿44.526328°N 94.720141°W﻿ / 44.526328; -94.720141﻿ (Minneapolis and St. Louis Depot) Fairfax Renville County's oldest and most intact railway station on its original site, built c. 1883. Also significant as a symbol of the local importance of railroads and as a regional example of a 19th-century frame passenger/freight depot. 44°46′34″N 94°59′00″W﻿ / ﻿44.776017°N 94.983357°W﻿ / 44.776017; -94.983357﻿ (Renville County Courthouse and Jail) Olivia Ornate 1902 courthouse designed by Fremont D. Orff, noted for its architectural significance and—with the adjacent 1904 jail—as the outcome of a particularly involved four-way, 28-year battle for county seat status. 44°40′20″N 95°17′37″W﻿ / ﻿44.67222°N 95.293677°W﻿ / 44.67222; -95.293677﻿ (Lars Rudi House) Sacred Heart vicinity 1868 cabin of prominent local pioneer Lars Rudi (1827–1913). Also Renville County's leading example of a log house, dating to the resumption of settlement after the Dakota War of 1862. 44°47′00″N 95°21′02″W﻿ / ﻿44.783333°N 95.350556°W﻿ / 44.783333; -95.350556﻿ (Sacred Heart Public School) Sacred Heart 1901 school with several additions, reflecting the 20th-century growth and educational expansion of small-town public schools. 1929 auditorium/gymnasium also noted as Sacred Heart's primary venue for public functions. 48°54′23″N 95°19′06″W﻿ / ﻿48.90637°N 95.31822°W﻿ / 48.90637; -95.31822﻿ (Canadian National Depot) Warroad 1914 station of the Canadian National Railway on U.S. soil, used by many emigrants leaving for Canada. 48°33′20″N 95°56′58″W﻿ / ﻿48.555602°N 95.949515°W﻿ / 48.555602; -95.949515﻿ (Lodge Boleslav Jablonsky No. 219) Poplar Grove Township 1916 clubhouse of a Czech American fraternal organization, representative of ethnic history in the last part of Minnesota to be settled by Euro-Americans. 48°50′45″N 95°45′56″W﻿ / ﻿48.845916°N 95.765569°W﻿ / 48.845916; -95.765569﻿ (Roseau County Courthouse) Roseau 1913 courthouse symbolic of Roseau County's governmental development. 45°18′22″N 93°33′59″W﻿ / ﻿45.306059°N 93.56647°W﻿ / 45.306059; -93.56647﻿ (Elk River Water Tower) Elk River 1920 water tower prompted by a need for firefighting infrastructure, noted for its impact on community development and as a representative of a once-common but vanishing design. 45°18′17″N 93°34′31″W﻿ / ﻿45.304722°N 93.575278°W﻿ / 45.304722; -93.575278﻿ (Elkhi Stadium) Elk River School/city athletic field begun with community labor in 1922 and improved by the National Youth Administration in 1940. Also known as Handke Stadium. 45°24′56″N 93°53′21″W﻿ / ﻿45.415618°N 93.88927°W﻿ / 45.415618; -93.88927﻿ (Herbert M. Fox House) Becker 1876 pioneer farmhouse, uniquely constructed of load-bearing vertical planks rather than wall studs. Moved in 2006 to the grounds of the Sherburne History Center. 45°15′27″N 93°32′16″W﻿ / ﻿45.257579°N 93.537802°W﻿ / 45.257579; -93.537802﻿ (Oliver H. Kelley Homestead) Elk River Farm occupied 1850–1870 by Oliver H. Kelley, founder of The National Grange of the Order of Patrons of Husbandry. Now a Minnesota Historical Society living history site. 45°32′35″N 94°07′00″W﻿ / ﻿45.543056°N 94.116667°W﻿ / 45.543056; -94.116667﻿ (Minnesota State Reformatory for Men Historic District) St. Cloud Prison complex of 23 contributing properties built 1887–1933 with granite quarried by inmates; noted for its architectural cohesion and association with penal reform and Minnesota's quarrying industry. Elk River County courthouse in service 1877–1980. Demolished by the county in 1995 for real estate sale. 44°35′56″N 93°54′01″W﻿ / ﻿44.598946°N 93.900195°W﻿ / 44.598946; -93.900195﻿ (Church of St. Thomas) Jessenland Township 1870 church of Minnesota's first Irish American farming settlement, established 1852. 44°33′38″N 94°13′17″W﻿ / ﻿44.560508°N 94.221497°W﻿ / 44.560508; -94.221497﻿ (Gaylord City Park) Gaylord City park established in 1897, a longtime recreational venue featuring a 1916 pavilion and a 1940 bridge built by the Works Progress Administration. 44°32′04″N 94°31′35″W﻿ / ﻿44.534424°N 94.526316°W﻿ / 44.534424; -94.526316﻿ (Gibbon Village Hall) Gibbon Unusual 1895 municipal hall with medieval-themed Romanesque Revival architecture. 44°31′42″N 93°54′25″W﻿ / ﻿44.528258°N 93.907013°W﻿ / 44.528258; -93.907013﻿ (Henderson Commercial Historic District) Henderson 2-block commercial center of an early river town and original county seat, with 12 contributing properties built 1874–c. 1905 also noted for their architectural cohesion. 44°31′41″N 93°54′38″W﻿ / ﻿44.528082°N 93.910443°W﻿ / 44.528082; -93.910443﻿ (August F. Poehler House) Henderson 1883 Queen Anne house of an influential local settler and businessman. Now houses the Sibley County Historical Museum. 44°33′22″N 94°13′14″W﻿ / ﻿44.556148°N 94.220613°W﻿ / 44.556148; -94.220613﻿ (Sibley County Courthouse and Sheriff's Residence and Jail) Gaylord 1916 Neoclassical and Spanish Colonial Revival public buildings reflective of Gaylord's growth leading to and continuing after achieving county seat status in 1915. 44°31′42″N 93°54′33″W﻿ / ﻿44.528395°N 93.909143°W﻿ / 44.528395; -93.909143﻿ (Sibley County Courthouse-1879) Henderson 1879 Italianate courthouse. Now houses the Joseph R. Brown River Heritage Center. 45°34′33″N 96°02′54″W﻿ / ﻿45.575927°N 96.048274°W﻿ / 45.575927; -96.048274﻿ (Alberta Teachers House) Alberta 1917 faculty housing associated with a key period of modernization in Minnesota's rural education system. 45°35′09″N 95°55′04″W﻿ / ﻿45.585751°N 95.917803°W﻿ / 45.585751; -95.917803﻿ (Morris Carnegie Library) Morris Well preserved and locally distinctive 1905 Carnegie library, a longstanding focus of education in Morris. Now the Stevens County Historical Society Museum. 45°35′25″N 95°54′29″W﻿ / ﻿45.590197°N 95.908107°W﻿ / 45.590197; -95.908107﻿ (Morris High School) Morris Building and grounds of a public school established in 1914 and expanded twice by 1950, reflecting the development and growth of public schools in Minnesota towns. Demolished in 2013 after no viable reuse plan could be found. 45°35′21″N 95°54′05″W﻿ / ﻿45.589131°N 95.901284°W﻿ / 45.589131; -95.901284﻿ (Morris Industrial School for Indians Dormitory) Morris 1899 dormitory, sole remaining campus building of a Native American boarding school active 1887–1909. Also a contributing property to the West Central School of Agriculture and Experiment Station Historic District. Now the University of Minnesota Morris's Multi-Ethnic Resource Center. 45°35′15″N 95°55′26″W﻿ / ﻿45.587365°N 95.923927°W﻿ / 45.587365; -95.923927﻿ (Lewis H. Stanton House) Morris 1881 house nicknamed "The Chimneys", noted for its Stick–Eastlake architecture and prominence among the housing stock of Morris. 45°35′25″N 95°54′00″W﻿ / ﻿45.590156°N 95.900087°W﻿ / 45.590156; -95.900087﻿ (West Central School of Agriculture and Experiment Station Historic District) Morris One of the country's longest-running and most intact residential agricultural high schools, operated 1910–1963 by the University of Minnesota's nationally influential agricultural education system. The 11 contributing properties built 1899–1929 are now part of the University of Minnesota Morris campus. 45°35′42″N 96°49′51″W﻿ / ﻿45.595027°N 96.830846°W﻿ / 45.595027; -96.830846﻿ (Browns Valley Carnegie Public Library) Browns Valley Carnegie library built 1915–16, Browns Valley's most architecturally significant early-20th-century building and an example of the libraries provided to small Minnesota communities by Andrew Carnegie's philanthropy. 45°48′17″N 96°30′01″W﻿ / ﻿45.804666°N 96.500183°W﻿ / 45.804666; -96.500183﻿ (Chicago, Milwaukee and St. Paul Depot) Wheaton Circa-1906 railway station, a well-preserved example of its type and a symbol of the importance of the railroad to Wheaton. Now houses the Traverse County Historical Society Museum. 46°00′02″N 96°29′35″W﻿ / ﻿46.000597°N 96.49314°W﻿ / 46.000597; -96.49314﻿ (District No. 44 School) Taylor Township Well-preserved example—active 1891–1954—of the one-room schoolhouses once common in rural Traverse County. 45°35′45″N 96°50′27″W﻿ / ﻿45.595796°N 96.840848°W﻿ / 45.595796; -96.840848﻿ (Fort Wadsworth Agency and Scout Headquarters Building) Browns Valley Only surviving log building of Fort Wadsworth, built in 1864; later a residence of Indian agent Joseph R. Brown and his son Sam Brown. Also a rare example of post-and-plank construction. Now preserved in Sam Brown Memorial State Wayside. 45°49′29″N 96°34′21″W﻿ / ﻿45.824829°N 96.572501°W﻿ / 45.824829; -96.572501﻿ (Larson's Hunters Resort) Wheaton vicinity Hunting resort complex with a prominent 1901 lodge/house, associated with western Minnesota's recreational hunting industry and the phenomenon of farmer/resort owners. Menahga vicinity One of the few surviving precontact archaeological sites in the Shell River basin of northwestern Wadena County, the region's most conducive zone for prehistoric human habitation. 46°26′22″N 95°08′15″W﻿ / ﻿46.439559°N 95.137577°W﻿ / 46.439559; -95.137577﻿ (Commercial Hotel) Wadena Circa-1885 hotel exemplifying the lodging facilities built in anticipation of Wadena's late-19th-century commercial growth. 46°26′31″N 95°08′17″W﻿ / ﻿46.442074°N 95.138032°W﻿ / 46.442074; -95.138032﻿ (Northern Pacific Passenger Depot) Wadena 1915 railway station symbolizing the impact of the Northern Pacific Railway on Wadena's establishment and development. Now a museum and event venue. 46°25′18″N 94°49′47″W﻿ / ﻿46.421721°N 94.829661°W﻿ / 46.421721; -94.829661﻿ (Old Wadena Historic District) Staples vicinity Seminal site of Euro-American activity in Wadena County, from three successive trading posts established in 1782, 1792, and 1825, to a town founded in 1856 and the county's first farm. Now a county park. 46°26′24″N 95°08′05″W﻿ / ﻿46.440032°N 95.134744°W﻿ / 46.440032; -95.134744﻿ (Peterson-Biddick Seed and Feed Company) Wadena Complex built 1916–1936 of a small wholesaling business that grew into one of Minnesota's largest independent agricultural companies. Demolished except for a c. 1935 warehouse addition. Wadena vicinity Site of a trading post established in 1792, significant for its role in and research potential on the opening of the fur trade in north-central Minnesota. 46°26′25″N 95°08′13″W﻿ / ﻿46.440164°N 95.136821°W﻿ / 46.440164; -95.136821﻿ (Wadena Fire and City Hall) Wadena 1912 multipurpose municipal hall representative of early-20th-century civic development and of a type of public building common to many small Minnesota cities. 44°03′02″N 94°25′04″W﻿ / ﻿44.050661°N 94.417735°W﻿ / 44.050661; -94.417735﻿ (Flanders' Block) Madelia Commercial building used to house the county offices, courthouse, and jail 1872–1878. 43°58′53″N 94°37′45″W﻿ / ﻿43.981408°N 94.629176°W﻿ / 43.981408; -94.629176﻿ (Grand Opera House) St. James St. James' principal venue 1892–1921 for fine performing arts as well as lectures, community events, and graduation ceremonies. 44°06′31″N 94°38′23″W﻿ / ﻿44.108665°N 94.639724°W﻿ / 44.108665; -94.639724﻿ (Nelson and Albin Cooperative Mercantile Association Store) Godahl General store established in 1894, Minnesota's oldest consumer cooperative still in operation. Better known as the Godahl Store. 43°57′21″N 94°36′48″W﻿ / ﻿43.955833°N 94.613333°W﻿ / 43.955833; -94.613333﻿ (Alfred R. Voss Farmstead) St. James vicinity Southern Minnesota's largest private 19th-century farm, established by prominent local Alfred R. Voss (1860–1952) in 1893. Also noted for two unusually large, elaborate buildings among the 13 contributing properties. 43°58′52″N 94°37′32″W﻿ / ﻿43.981237°N 94.625693°W﻿ / 43.981237; -94.625693﻿ (Watonwan County Courthouse) St. James Exemplary Romanesque Revival courthouse built 1895–96; also significant as Watonwan County's long-serving seat of government. 44°02′40″N 94°25′54″W﻿ / ﻿44.044433°N 94.431788°W﻿ / 44.044433; -94.431788﻿ (West Bridge) Madelia 1908 steel truss bridge, the only surviving work of seminal Minnesota bridge builder Commodore P. Jones. Also noted for its early use of riveted joints. 46°27′27″N 96°39′34″W﻿ / ﻿46.4575°N 96.659444°W﻿ / 46.4575; -96.659444﻿ (Femco Farm No. 2) Kent vicinity 1922 farm with nine contributing properties, the best preserved of five Femco Farms established by newspaper publisher Frederick E. Murphy (d. 1940) in Wilkin County to experiment with diversified farming and stock breeding. 46°28′31″N 96°16′59″W﻿ / ﻿46.475183°N 96.283096°W﻿ / 46.475183; -96.283096﻿ (J. A. Johnson Blacksmith Shop) Rothsay 1903 blacksmith shop with many of its original tools, a rare intact example of a type once common in Midwestern agricultural communities. 46°37′01″N 96°38′44″W﻿ / ﻿46.617003°N 96.645574°W﻿ / 46.617003; -96.645574﻿ (David N. Peet Farmstead) Wolverton vicinity Farmstead of a prosperous late-19th-century farmer, with four contributing properties built 1901–1920. 46°10′38″N 96°24′34″W﻿ / ﻿46.177266°N 96.409543°W﻿ / 46.177266; -96.409543﻿ (Stiklestad United Lutheran Church) Doran vicinity Church built 1897–8, significant for its Carpenter Gothic architecture and association with the area's Norwegian immigrants. 46°15′38″N 96°35′14″W﻿ / ﻿46.260427°N 96.587253°W﻿ / 46.260427; -96.587253﻿ (Wilkin County Courthouse) Breckenridge 1928 courthouse significant for its Beaux-Arts architecture and as the seat of county government. 46°33′55″N 96°44′08″W﻿ / ﻿46.565341°N 96.735496°W﻿ / 46.565341; -96.735496﻿ (Wolverton Public School) Wolverton Long-serving school built in 1906 and expanded in 1917. Rothsay 1899 Independent Order of Odd Fellows hall. Demolished in 1988. 46°02′40″N 96°27′12″W﻿ / ﻿46.044413°N 96.453314°W﻿ / 46.044413; -96.453314﻿ (Tenney Fire Hall) Tenney 1904 fire station representative of municipal services in Minnesota's smallest towns. Destroyed by a fire in 2010. 44°42′33″N 96°16′34″W﻿ / ﻿44.709167°N 96.276111°W﻿ / 44.709167; -96.276111﻿ (Canby Commercial Historic District) Canby Regional trade center and well-preserved example of western Minnesota's commercial districts rebuilt after disastrous fires, with 24 contributing properties built 1892–1930s. 44°42′42″N 96°16′22″W﻿ / ﻿44.71159°N 96.27281°W﻿ / 44.71159; -96.27281﻿ (John G. Lund House) Canby 1891 house and carriage barn of an influential local land speculator, banker, and politician. Also noted for the house's 1900 Queen Anne remodeling. Now the Lund–Hoel House museum. 44°42′28″N 96°16′30″W﻿ / ﻿44.707843°N 96.274893°W﻿ / 44.707843; -96.274893﻿ (Lundring Service Station) Canby 1926 example of the small, period revival gas stations built in the United States in the 1920s and '30s, and a distinctive use of English Cottage Revival architecture. 44°39′34″N 95°54′12″W﻿ / ﻿44.659444°N 95.903333°W﻿ / 44.659444; -95.903333﻿ (Swede Prairie Progressive Farmers' Club) Clarkfield vicinity 1915 meeting hall of a local farmers' organization, a rare physical reminder of the grassroots agricultural movements of the early 20th century. Likely demolished. 44°44′04″N 95°27′07″W﻿ / ﻿44.734452°N 95.451842°W﻿ / 44.734452; -95.451842﻿ (Upper Sioux Agency) Granite Falls vicinity Site of a federal indian agency active 1854–1862, with one standing building. Significant for its precontact archaeology, rare physical evidence of the agency period, and association with the nation's disastrous mid-19th-century Federal Indian Policy. 44°48′33″N 95°32′24″W﻿ / ﻿44.809224°N 95.540008°W﻿ / 44.809224; -95.540008﻿ (Andrew John Volstead House) Granite Falls House from 1894 to 1930 of 10-term Congressman Andrew Volstead (1860–1947), author of the Volstead Act that enabled Prohibition in the United States, and the Capper–Volstead Act that legalized agricultural cooperatives. Now a museum. 44°42′26″N 95°26′20″W﻿ / ﻿44.707123°N 95.438935°W﻿ / 44.707123; -95.438935﻿ (Wood Lake Battlefield Historic District) Sioux Agency Township Site of the Battle of Wood Lake, final engagement of the Dakota War of 1862, a watershed period for the state of Minnesota and the Dakota people. District encompasses the late-September 1862 staging and battle sites and a 1910 monument that embodies early-20th-century commemoration efforts. Wikimedia Commons has media related to National Register of Historic Places in Minnesota. ^ National Park Service (April 24, 2008). "National Register Information System". National Register of Historic Places. National Park Service. ^ "National Register of Historic Places: Weekly List Actions". National Park Service. Retrieved January 2, 2009. 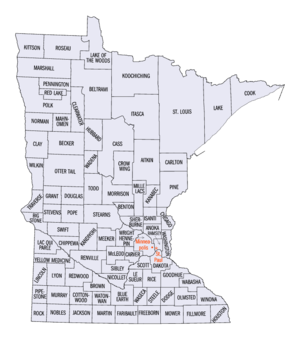 ^ The following sites are listed in multiple counties: Anoka–Champlin Mississippi River Bridge (Anoka and Hennepin), Broadway Bridge (St. Peter, Minnesota), (Le Sueur and Nicollet), Crow Wing State Park (Cass, Crow Wing and Morrison), Dodd Road Discontinuous District (Le Sueur and Rice), Fort Snelling (Dakota and Hennepin), Fort Snelling-Mendota Bridge (Dakota and Hennepin), Hanover Bridge (Hennepin and Wright), Intercity Bridge (Hennepin and Ramsey), Itasca State Park (Becker, Clearwater and Hubbard), Lac qui Parle Mission Site (Chippewa and Lac Qui Parle), Meeker Island Lock and Dam (Hennepin and Ramsey), and Winnibigoshish Lake Dam (Cass and Itasca). ^ a b c d e f g h i j k l m n o p q r s t u v w x y z aa ab ac ad ae af ag ah ai aj ak al Numbers represent an ordering by significant words. Various colorings, defined here, differentiate National Historic Landmarks and historic districts from other NRHP buildings, structures, sites or objects. ^ a b c d e f g h i j k l m n o p q r s t u v w x y z aa ab The eight-digit number below each date is the number assigned to each location in the National Register Information System database, which can be viewed by clicking the number. ^ Haidet, Mark (November 1980). "Minnesota Historic Properties Inventory Form: Ss. Peter and Paul Catholic Church Complex". National Park Service. Retrieved October 4, 2015. ^ Haidet, Mark (November 1980). "Minnesota Historic Properties Inventory Form: Cota Round Barns". National Park Service. Retrieved October 4, 2015. ^ Haidet, Mark (November 1980). "Minnesota Historic Properties Inventory Form: Esselman Brothers General Store". National Park Service. Retrieved October 4, 2015. ^ a b c d e f g h Federal and state laws and practices restrict general public access to information regarding the specific location of this resource. In some cases, this is to protect archeological sites from vandalism, while in other cases it is restricted at the request of the owner. See: Knoerl, John; Miller, Diane; Shrimpton, Rebecca H. (1990), Guidelines for Restricting Information about Historic and Prehistoric Resources, National Register Bulletin (29), National Park Service, U.S. Department of the Interior, OCLC 20706997 . ^ George, Douglas (April 13, 1973). "National Register of Historic Places Inventory – Nomination Form: Posch Site". National Park Service. ^ Haidet, Mark (November 1980). "Minnesota Historic Properties Inventory Form: Leonard Robinson House". National Park Service. Retrieved September 6, 2015. ^ "Ronneby Charcoal Kiln". Minnesota National Register Properties Database. Minnesota Historical Society. 2009. Retrieved November 6, 2012. ^ "Changes to the National Register of Historic Places in Minnesota, 2003-2010". Minnesota State Historic Preservation Office. February 1, 2011. Retrieved August 23, 2013. ^ Hess, Jeffrey A. (January 28, 1987). "National Register of Historic Places Inventory—Nomination Form: Gran Evangelical Lutheran Church". National Park Service. Retrieved April 23, 2016. ^ "The Itasca Bison Kill Site". From Site to Story: The Upper Mississippi's Buried Past. The Institute for Minnesota Archaeology. June 27, 1999. Retrieved September 21, 2012. ^ a b c Mitchell, Diana (March 9, 1973). "National Register of Historic Places Inventory – Nomination Form: Itasca State Park". National Park Service. Retrieved April 23, 2016. ^ Schissel, Pat; Scott Anfinson (November 15, 1977). "National Register of Historic Places Inventory -- Nomination Form: The Lower Rice Lake Archaeological District". National Park Service. ^ Anfinson, Scott; Pat Schissel (November 14, 1977). "National Register of Historic Places Inventory -- Nomination Form: Upper Rice Lake District". National Park Service. ^ Roberts, Norene A.; Charles Quinn (July 5, 1985). "National Register of Historic Places Inventory—Nomination Form: Isaac Bargen House". National Park Service. Retrieved May 21, 2016. ^ Roberts, Norene A.; Charles Quinn (July 5, 1985). "National Register of Historic Places Inventory—Nomination Form: Chicago St. Paul Minneapolis and Omaha Depot". National Park Service. Retrieved May 21, 2016. ^ "Westbrook Heritage House Museum". Explore Minnesota. Retrieved May 21, 2016. ^ Nelson, Charles W.; Susan Zeik (October 26, 1976). "National Register of Historic Places Inventory -- Nomination Form: Cottonwood County Courthouse". National Park Service. Retrieved May 21, 2016. ^ "The Rock". Minnesota Historical Society. Retrieved May 15, 2016. ^ Johnson, Elden (April 28, 1970). "National Register of Historic Places Inventory – Nomination Form: Jeffers Petroglyph Site 21CO3". National Park Service. Retrieved May 15, 2016. ^ Bonney, Rachel A. "Early Woodland in Minnesota". Plains Anthropologist 15.50 (1970): 302-304: 302. ^ Johnson, Elden (December 27, 1971). "National Register of Historic Places Inventory – Nomination Form: Mountain Lake Site". National Park Service. ^ Ostberg, Gary (January 3, 1984). "National Register of Historic Places Inventory—Nomination Form: Albert Lea City Hall". National Park Service. Retrieved September 5, 2016. ^ a b Roberts, Norene A. (January 30, 1986). "National Register of Historic Places Inventory—Nomination Form: Albert Lea Commercial Historic District". National Park Service. Retrieved September 5, 2016. ^ Gimmestad, Dennis A. (January 1981). "National Register of Historic Places Inventory—Nomination Form: Chicago, Milwaukee, St. Paul, and Pacific Railroad Depot". National Park Service. Retrieved September 5, 2016. ^ Roberts, Norene A. (July 31, 1985). "National Register of Historic Places Inventory—Nomination Form: Clarks Grove Cooperative Creamery". National Park Service. Retrieved September 5, 2016. ^ Roberts, Norene A. (July 24, 1985). "National Register of Historic Places Inventory—Nomination Form: Lodge Záře Zapádu No. 44". National Park Service. Retrieved September 4, 2016. ^ Roberts, Norene A. (July 18, 1985). "National Register of Historic Places Inventory—Nomination Form: H. A. Paine House". National Park Service. Retrieved September 4, 2016. ^ Roberts, Norene A. (April 29, 1985). "National Register of Historic Places Inventory—Nomination Form: Dr. Albert C. Wedge House". National Park Service. Retrieved September 4, 2016. ^ "Niebuhr, John, Farmhouse (removed)". Minnesota National Register Properties Database. Minnesota Historical Society. 2009. Retrieved December 10, 2012. ^ a b c d e f g h i j k Nord, Mary Ann (2003). The National Register of Historic Places in Minnesota. Minnesota Historical Society. ISBN 0-87351-448-3. ^ Nelson, Charles W. (October 31, 1973). "National Register of Historic Places Inventory – Nomination Form: Fort Pomme de Terre Site". National Park Service. ^ Granger, Susan (October 1983). "National Register of Historic Places Inventory—Nomination Form: Grant County Courthouse". National Park Service. Retrieved September 5, 2016. ^ Granger, Susan (August 1984). "National Register of Historic Places Inventory—Nomination Form: Roosevelt Hall". National Park Service. Retrieved September 5, 2016. ^ Ganzel, Emily (November 2014). "National Register of Historic Places Registration Form: Anna J. Scofield Memorial Auditorium and Harold E. Thorson Memorial Library" (PDF). National Park Service. Retrieved June 25, 2016. ^ LeVasseur, Andrea (September 6, 2016). "National Register of Historic Places Registration Form: Consolidated School District No. 22" (PDF). National Park Service. Retrieved February 20, 2017. ^ Gimmestad, Dennis A. (August 29, 1983). "National Register of Historic Places Inventory—Nomination Form: Hubbard County Courthouse". National Park Service. Retrieved October 23, 2015. ^ "Hubbard County Historical Society - Museum". Hubbard County Historical Society. 2013. Retrieved July 20, 2014. ^ Gruss, Fremont; Karen Gruss (April 28, 1978). "National Register of Historic Places Inventory -- Nomination Form: Moser, Louis J., Homestead (known as Louie's Camp)". National Park Service. Retrieved July 20, 2014. ^ "Fremont's Point Resort - Cabins and History". Fremont's Point Resort. Retrieved November 12, 2013. ^ Hess, Jeffrey A. (February 3, 1987). "National Register of Historic Places Inventory—Nomination Form: Park Rapids Jail". National Park Service. Retrieved July 20, 2014. ^ George, Douglas (May 1, 1973). "National Register of Historic Places Inventory – Nomination Form: Shell River Prehistoric Village and Mound District". National Park Service. ^ Koop, Michael (January 27, 1988). "National Register of Historic Places Registration Form: Church of the Sacred Heart (Catholic)". National Park Service. Retrieved December 4, 2016. ^ Granger, Susan (February 1986). "National Register of Historic Places Inventory—Nomination Form: District School No. 92". National Park Service. Retrieved December 4, 2016. ^ Granger, Susan (March 1986). "National Register of Historic Places Inventory—Nomination Form: Jackson Commercial Historic District". National Park Service. Retrieved December 4, 2016. ^ Nelson, Charles W. (October 26, 1976). "National Register of Historic Places Inventory -- Nomination Form: Jackson County Courthouse". National Park Service. Retrieved December 4, 2016. ^ Granger, Susan (February 1986). "National Register of Historic Places Inventory—Nomination Form: George M. Moore Farmstead". National Park Service. Retrieved November 19, 2016. ^ "Winter Hotel (removed)". 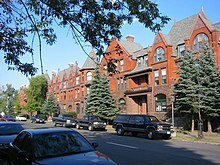 Minnesota National Register Properties Database. Minnesota Historical Society. 2009. Retrieved December 25, 2012. ^ Haidet, Mark (March 1980). "Minnesota Historic Properties Inventory Form: Bronson Farm". National Park Service. Retrieved December 9, 2016. ^ Nelson, Charles W.; Susan Zeik (November 2, 1976). "National Register of Historic Places Inventory -- Nomination Form: Kanabec County Courthouse". National Park Service. Retrieved December 9, 2016. ^ Haidet, Mark (March 1980). "Minnesota Historic Properties Inventory Form: Ogilvie Watertower". National Park Service. Retrieved December 9, 2016. ^ Haidet, Mark (February 1980). "Minnesota Historic Properties Inventory Form: Williams, C.E., House". National Park Service. Retrieved December 9, 2016. ^ Haidet, Mark (March 1980). "Minnesota Historic Properties Inventory Form: Zetterberg Company". National Park Service. Retrieved December 4, 2016. ^ Leatherberry, E. C. "Minnesota, Kanabec County, Coin School (194)". Flickr. Retrieved September 5, 2013. ^ Location derived from Anfinson, Scott (2009). "Finding Minnesota: A Geographic Guide to Minnesota Archaeology" (PDF). Minnesota Office of the State Archaeologist. Retrieved December 18, 2012. NRIS lists site as "address restricted". ^ Anfinson, Scott (2009). "Finding Minnesota: A Geographic Guide to Minnesota Archaeology" (PDF). Minnesota Office of the State Archaeologist. Retrieved December 18, 2012. ^ Anderson, Rolf T. (September 6, 1988). "National Register of Historic Places Registration Form:Lake Bronson State Park WPA/Rustic Style Historic Resources" (PDF). National Park Service. Retrieved June 23, 2014. ^ Harvey, Thomas (October 31, 1983). "National Register of Historic Places Inventory—Nomination Form: St. Nicholas Orthodox Church" (PDF). National Park Service. Retrieved June 23, 2014. ^ Paul, Daniel D.; Richard Starzak (July 2011). "National Register of Historic Places Registration Form: U.S. Inspection Station—Noyes, Minnesota" (PDF). National Park Service. Retrieved July 16, 2016. ^ Tschofen, Carmen (March 15, 2005). "National Register of Historic Places Registration Form: Canadian National Railways Depot". National Park Service. Retrieved March 25, 2017. ^ Birk, Douglas A. (November 18, 1982). "National Register of Historic Places Inventory—Nomination Form: Fort St. Charles Archaeological Site". National Park Service. ^ "Historical Timeline of Fort St. Charles". Fort St. Charles. 2017. Retrieved March 25, 2017. ^ Anderson, Rolf T. (April 30, 1993). "National Register of Historic Places Registration Form: Norris Camp". National Park Service. Retrieved March 25, 2017. ^ Mitchell, Diana (January 29, 1973). "National Register of Historic Places Inventory – Nomination Form: Northwest Point". National Park Service. Retrieved March 25, 2017. ^ "Spooner School (removed)". Minnesota National Register Properties Database. Minnesota Historical Society. 2009. Retrieved February 8, 2013. ^ VanBrocklin, Lynne (December 11, 1974). "National Register of Historic Places Inventory – Nomination Form: Danebod". National Park Service. Retrieved April 15, 2017. ^ Roth, Susan (May 1980). "Minnesota Historic Properties Inventory Form: Drammen Farmers' Club". National Park Service. Retrieved April 15, 2017. ^ Roth, Susan (October 1980). "National Register of Historic Places Inventory—Nomination Form: Lake Benton Opera House and Kimball Building" (PDF). National Park Service. Retrieved April 15, 2017. ^ Roth, Susan (May 1980). "Minnesota Historic Properties Inventory Form: Lincoln County Courthouse & Jail". National Park Service. Retrieved April 15, 2017. ^ Roth, Susan (May 1980). "Minnesota Historic Properties Inventory Form: Lincoln County Fairgrounds". National Park Service. Retrieved April 15, 2017. ^ Roth, Susan (May 1980). "Minnesota Historic Properties Inventory Form: Ernest Osbeck House". National Park Service. Retrieved April 15, 2017. ^ Roth, Susan (May 1980). "Minnesota Historic Properties Inventory Form: Tyler Public School". National Park Service. Retrieved April 15, 2017. ^ Koop, Michael (July 1987). "National Register of Historic Places Registration Form: Mahnomen City Hall". National Park Service. Retrieved May 27, 2017. ^ Harvey, Thomas (October 31, 1983). "National Register of Historic Places Inventory—Nomination Form: Mahnomen County Courthouse". National Park Service. Retrieved May 27, 2017. ^ Koop, Michael (July 1987). "National Register of Historic Places Registration Form: Mahnomen County Fairgrounds Historic District". National Park Service. Retrieved May 6, 2017. ^ Mitchell, Diana (March 7, 1973). National Register of Historic Places Inventory – Nomination Form: Old Mill (Report). National Park Service. Retrieved May 27, 2017. ^ Anderson, Rolf T. (August 28, 1988). "National Register of Historic Places Registration Form: Old Mill State Park WPA/Rustic Style Historic Resources". National Park Service. Retrieved May 27, 2017. ^ Kooiman, Barbara; Michael Larson (April 2002). National Register of Historic Places Registration Form: K. J. Taralseth Company (Report). National Park Service. Retrieved May 27, 2017. ^ Hoisington, Daniel J. (June 2012). "National Register of Historic Places Registration Form: Glencoe Grade and High School" (PDF). Retrieved February 17, 2013. ^ Sazevich, James A.; Rolf Anderson (November 15, 1983). National Register of Historic Places Inventory—Nomination Form: Merton S. Goodnow House (Report). National Park Service. Retrieved May 29, 2017. ^ Spaeth, Lynne VanBrocklin (April 7, 1977). National Register of Historic Places Inventory -- Nomination Form: Hutchinson Free Public Library (Report). National Park Service. Retrieved May 29, 2017. ^ Hoisington, Daniel J. (March 1, 2009). National Register of Historic Places Registration Form: Komensky School (Report). National Park Service. Retrieved May 29, 2017. ^ Sazevich, James A. (November 15, 1983). National Register of Historic Places Inventory—Nomination Form: McLeod County Courthouse (Report). National Park Service. Retrieved May 29, 2017. ^ Hoisington, Daniel J. (March 14, 2012). "National Register of Historic Places Registration Form: Merrill, Harry, House" (PDF). Retrieved February 17, 2013. ^ Nelson, Charles; Susan Roth (April 27, 1982). National Register of Historic Places Inventory—Nomination Form: Winsted City Hall (Report). National Park Service. Retrieved May 29, 2017. ^ "Community Growth: Ada Village Hall". Minnesota from the Railroad. Minnesota Historical Society. 2007. Retrieved March 1, 2013. ^ Hesser, Heather; Elizabeth A. Butterfield; Barbara M. Kooiman. "National Register of Historic Places Registration Form: Minneapolis St. Paul and Sault Ste. Marie Depot". National Park Service. Retrieved November 11, 2018. ^ Hess, Demian (July 1989). "National Register of Historic Places Registration Form: Red River Trail (Woods Trail): Goose Lake Swamp Section". National Park Service. Retrieved November 11, 2018. ^ Gimmestad, Dennis (February 16, 1983). "National Register of Historic Places Inventory—Nomination Form: Thief River Falls Public Library". National Park Service. Retrieved November 11, 2018. ^ Hoisington, Daniel J. (June 10, 1998). "National Register of Historic Places Registration Form: Cathedral of the Immaculate Conception". National Park Service. Retrieved November 3, 2018. ^ Roth, Susan; Charles Nelson (May 6, 1982). "National Register of Historic Places Inventory—Nomination Form: St. Peter's Church". National Park Service. Retrieved November 3, 2018. ^ Roberts, Norene (December 12, 1983). "National Register of Historic Places Inventory—Nomination Form: Crookston Carnegie Public Library". National Park Service. Retrieved October 27, 2018. ^ Roberts, Norene (November 1983). "National Register of Historic Places Inventory—Nomination Form: Crookston Commercial Historic District". National Park Service. Retrieved October 27, 2018. ^ Harvey, Thomas (December 11, 1983). "National Register of Historic Places Inventory—Nomination Form: Davis, E.C., House". National Park Service. Retrieved October 27, 2018. ^ Harvey, Thomas (December 13, 1983). "National Register of Historic Places Inventory—Nomination Form: Hamm Brewing Company Beer Depot". National Park Service. Retrieved October 27, 2018. ^ Anderson, David C. (May 15, 1999). "National Register of Historic Places Registration Form: Clearwater Evangelical Lutheran Church". National Park Service. Retrieved October 27, 2018. ^ Gimmestad, Dennis (February 16, 1983). "National Register of Historic Places Inventory—Nomination Form: Red Lake County Courthouse". National Park Service. Retrieved October 27, 2018. ^ Mitchell, Diana (March 27, 1973). "National Register of Historic Places Inventory – Nomination Form: Birch Coulee". National Park Service. Retrieved May 19, 2015. ^ "Birch Coulee Battlefield". Minnesota Historical Society. Retrieved May 19, 2015.